Nebrissa bimacula Walker, 1862, J. Linn. Soc. Lond. (Zool,) 6:194. Diagnosis. The forewings are pale brownish grey, only faintly fasciated, but with an irregular, brownish marginal zone that bulges basad centrally; this bulge is a much darker brown. Taxonomic notes. The species is closely related to A. terminata Hampson (N.E. Himalaya) and A. triangulata Wileman & West (Philippines, Sulawesi). 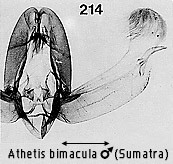 In bimacula Hampson the clavus is broadened, triangular, and the long, irregular distal cornutus in the vesica is diagnostic; the other taxa have a group of cornuti in this position as does A. reclusa. Geographical range. Borneo, Peninsular Malaysia, Sumatra. Habitat preference. The species appears to be rare, the only Bornean material seen being that collected by A.R. Wallace in lowland Sarawak. A Sumatran male is also from the lowlands, but the species has been taken at 600m in Peninsular Malaysia. It probably favours open habitats.